Xi Jinping, indisputably, is the most consequential Chinese leader since the period of Deng Xiaoping. Much has been written, usually from a short-term perspective, about how he is transforming China, The five articles that follow aspire to a wider-ranging understanding of his impact. First, Ezra Vogel, biographer of Deng Xiaoping, offers a comparative perspective on Xi’s leadership qualities. Second, Alison Kaufman takes a close look at Xi as an historian, probing his speeches for different aspects of how he thinks about history. Third, Jacques deLisle examines the Xi approach to the rule of law, both at home and in international relations. Fourth, Andrew Erickson reflects on Xi as a military leader, rapidly adding new capabilities. Fifth, also bringing us up to date after Xi’s late September summit with Barack Obama, Robert Sutter gives a grade to Xi’s policy toward the United States. Of course, much is omitted from the record of a leader who has assumed personal charge over China’s economy, who is steering a bold foreign policy in Asia through the “One Road, One Belt” initiative, and who is immersed in a struggle against corruption with far-reaching consequences. We do not pretend to cover all of the far-reaching aspects of Xi Jinping’s leadership. What we can do is juxtapose insights into his thinking and impact as he concludes three years at the top and at a juncture when conclusions about Xi are in dispute, e.g., between observers in Tokyo and Seoul and even among experts in Washington. The five dimensions treated here cover a rather diverse range. Vogel focuses on the big picture, comparing in broad strokes Xi with the leader who set China on a course of rapid modernization and involvement in the international community. Kaufman delves into Xi’s worldview, concentrating on multiple dimensions of his historical outlook. DeLisle probes Xi’s understanding of the rule of law, pointing to the clearly contradictory phenomena of insisting more emphatically on its presence while undermining it in critical respects. Erickson leaves no ambiguity about Xi’s intention to build China’s military at breakneck speed. Finally, Sutter, analyzes the duality in Xi’s approach to the United States, appealing for improved relations while wrecking the foundation that has served this relationship well. 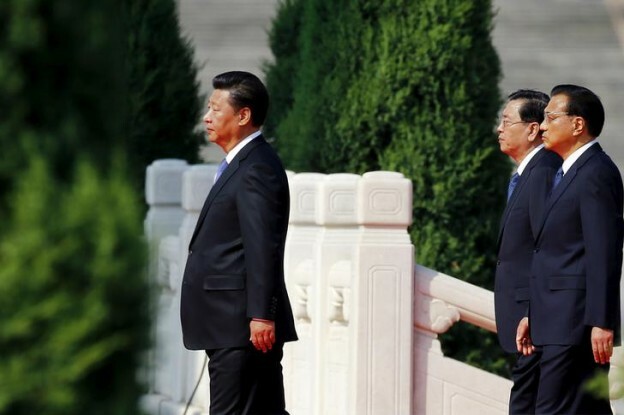 Kaufman and deLisle discuss the underpinnings of policies in many arenas, while Erickson and Sutter elucidate two critical aspects of how international relations have been unfolding under Xi Jinping’s leadership. Despite Vogel’s doubts about Xi’s preparedness to lead, he has taken the reins with vigor and set China on a course strikingly at odds with Deng’s. Our coverage begins with an interview with Ezra Vogel, elucidating his insights. Vogel compares the background of Deng and Xi before they gained the top position. He argues that Deng was much more experienced and prepared to take charge. Then he contrasts China in 1978, when an entirely new course was required, to China in 2012, when modernization was far along but certain things were going badly. Deng chose to “lie low,” while Xi was emboldened. Another contrast is that Deng chose to delegate power to those he knew, but Xi needed to boost his own stature through a formal structure, as he became a micromanager. Vogel concludes, Xi is not as strong a leader as Deng because he does not have the accumulated experience in managing the centralized bureaucracy, the unquestioned authority based on decades of leadership, and the sure hand as an experienced policy manager at the top of the party and state. Yet, the other authors affirm Xi’s strong leadership and confident transformations of policies. In contrast to Deng, Xi has no old guard of revolutionary leaders to limit his authority. Vogel’s comparisons of the two leaders extend to foreign policy. He argues that Deng considered good relations with the major powers paramount, not prone to bravado. Deng saw little need to play the anti-imperialist card. Vogel holds that Deng was an instinctive patriot, who believed in the people of China and its past successes and the successes of the Communist Party in unifying a vast country and beginning modernization process. He wanted China to take a low posture in international affairs and never to seek to become a hegemon. Vogel adds, Deng was impressed with the wisdom of Lee Kuan-yew and various Hong Kong businessmen about positively respecting Chinese tradition, while acting vigorously and not defensively to embrace the international community. He finds that Xi has encouraged Chinese media to take a more critical stance toward Japan and the United States, but it is unlikely, if Deng were still alive, that Deng would have supported such assertiveness. Deng was more committed to learning from them, maintaining good ties to them, and not championing ideology or national identity in a manner that would cause others to be wary of China’s intentions. Some of the other authors trace policies that preceded Xi’s leadership that had started down the path of assertiveness, but they all perceive ways of thinking, approaches to law, support for the military, or opposition to the United States that broke new ground, turning China sharply away from Deng’s legacy. The emphasis throughout is on how different Xi’s approach is from Deng’s. Kaufman differentiates Xi’s historical worldview into several dimensions. She notes, he has interpreted the significance of Chinese historical events against the backdrop of four meaning-making frameworks: Marxism, Confucianism, nationalism, and globalism. He also has shown a persistent eagerness to tie his own rule, the rule of the Chinese Communist Party (CCP), and his aspirations for China’s future international role, to both China’s communist and its earlier past. Kaufman suggests that political legitimacy long has rested on how able leaders and political systems are to respond to well-recognized historical imperative to “save” China from a subjugated past and make it strong, powerful, and respected by other nations and by its own people. As for the first dimension, she notes, Xi’s Marxist framework allows him to assert that China’s international rise under the CCP is both historically determined and morally just. Since China under the CCP embodies the forces of progress, anyone who attempts to stop that progress is reactionary and doomed eventually to fail, Kaufman observes, and while many countries were involved in China’s subjugation during the “century of humiliation,” the narrative focuses intensely on Japan’s actions, even to today. Xi must also be understood as a Chinese historian, in that he frequently draws on unique aspects of China’s history and civilization—particularly its premodern civilization—even if, at times, there is tension with Marxism. Xi calls for a return to China’s premodern golden age in international relations—the right historical path is one that would return China to its position of centrality and power, but on the foundation of a socialist society. Quoting Xi, she sees the CCP claiming justification not only because of its ability to bring China into the era of national rejuvenation, not only because it is the global force of justice, but also because it is the standard-bearer for the traditional essence of Chineseness. Use of traditional culture allows Xi to argue that China is uniquely suited to be a leading force for international peace, emphasizing aspects of Chinese thought that center on peace and progress. Also as a nationalist historian, he emphasizes the distinctiveness of Chinese national identity and culture, and the inherent unity of the Chinese nation. In conclusion, Kaufmann finds Xi Jinping’s use of history is less a departure from his predecessors than the attention accorded to it has implied. He has followed long-standing traditions of using China’s humiliation narrative to justify the CCP’s international aspirations, and he has carried forward Hu Jintao’s reemphasis on China’s traditional culture and even, to some degree, his reopening to the Kuomintang (KMT). She notes, however, Xi’s globalizing impulse is perhaps the most innovative element of his thinking, He has integrated diverse and even contradictory strands of historiographical traditions to make a case for China as a peaceful, unifying, and universalist world power. Yet, ideals such as these seem to be overshadowed by the national identity implications of claims to China’s uniqueness and distinctiveness from the existing international community. Looking at Kaufman’s observations from the perspective of the other articles, we can discern how claims about history underscore approaches to both international relations and law. They play a large role in explaining how Xi Jinping presents the challenge China poses to the US-led international order and to the rule of law. Both the Sutter and deLisle articles emphasize contradictions between what China has been claiming—cooperating with the United States, accepting the international order, and strengthening the rule of law—and the increasingly clear reality of Xi’s policies. Interpretations of history are critical in explaining these contradictions. Jacques deLisle takes a comprehensive look at Xi Jinping’s impact on China’s legal development, ranging from human rights, to the economy, to international issues. Despite increased emphasis on law in rhetoric and policy statements, the reality has been very different, deLisle notes. For domestic law, the approach appears to be still reformist-developmentalist (in providing frameworks for economic growth and means for checking threats to prosperity, including those emanating from the party-state), but more Leninist (in being less liberal, more centralized, and more narrowly instrumentalist). For international law, he finds the Xi-era perspective to be more nationalist (instrumentalist in advancing China’s interests and preferences) and, at least, potentially revisionist (challenging currently dominant rules and interpretations). The Xi leadership, he finds, appears to see law as an instrument to address party-state behavior that poses potentially existential threats to the regime, including, most prominently, corruption. Yet, the more striking aspects of law’s place in politics under Xi have been illiberal and repressive, he concludes. Some Chinese activists characterize these uses of law as “legalist repression,” and more restrictive laws are in the works for civil society organizations, including to regulate the activities of foreign NGOs, restrict foreign funding for Chinese NGOs, and to authorize measures to enhance state security. These developments have been unfolding in the context of critiques of constitutionalism and Western values that, deLisle explains, brought amplifications of pre-Xi-era rejections of Western-style principles of limited government, separation of powers, and liberal rights. Law clearly is the gateway for understanding a wide variety of policy choices, domestically and internationally. Under Xi, China has led in establishing new institutions with potentially significant implications for the international economic legal order. According to Beijing, the Asian Infrastructure Investment Bank (AIIB), the BRICS-centered New Development Bank (NDB), a related emergency lending facility (to address balance of payments crises), and other moves are consistent with existing legal norms and institutions and, indeed, are much-needed—and multilateral—responses to the failure of the International Monetary Fund (IMF) and World Bank. But these moves have heightened concerns in Washington that China is developing means—and may be seeking to use those means—to leverage its economic power to remake international legal rules and organizations to fit its preferences. The AIIB, NDB and other initiatives have raised concerns in Washington that, notwithstanding Beijing’s representations, they might challenge the World Bank and IMF-centered status quo, concludes deLisle. China has accepted many status quo legal norms and institutions relating to maritime issues, joining the major framework treaty (United Nations Convention on the Law of the Sea, UNCLOS), passing implementing legislation, and asserting its rights—in terms that track UNCLOS categories—to territorial seas, contiguous zones, continental shelves, and exclusive economic zones in areas adjacent to land that China claims as its territory. But these steps have coincided with unorthodox and system-challenging positions on key legal issues, deLisle finds. China’s argument departs from prevailing views of international law in placing greater weight on early discovery and according less significance to more recent history and long-standing exercises of control by other states, he adds. Developments under Xi have made these legal conflicts more pointed and salient, and. Chinese sources have begun to articulate a potentially strongly revisionist legal argument, asserting “historic rights” (primarily in the South China Sea). In this respect and others, such as Internet control, readers are told that China is challenging legal arrangements. Thus, it definitely is not a status quo power. According to Erickson, Xi’s impact on China’s military development is to put it on track to realize much of his dream of a strong country with a strong military. During his decade in office, the military will have grown far more rapidly in quality than quantity, giving China unprecedented options for pursuing disputed claims in the Near Seas. Far more important for Xi’s “China Military Dream” than limited agreements in Washington were the capabilities he unveiled in Beijing’s September 3 military parade, Erickson adds. Downsizing is designed to make the People’s Liberation Army (PLA), literally, leaner and meaner. China has developed a broad array of potent asymmetric weapons systems that pit China’s strengths against adversaries’ weaknesses, enabling China to exploit its formidable geography and resources to further its Near Seas claims. It will be increasingly capable of contesting US sea control within growing range rings extending beyond Beijing’s unresolved island and maritime claims in the Near Seas. For the Near Seas missions, likely to be prioritized throughout Xi’s tenure, however, China has many work-arounds able to compensate for limitations in both hardware and software, concludes Erickson. Similar to legal policies, military force development serves as the foundation for how Xi faces many possibilities. Erickson focuses on the results of the Obama-Xi summit, acknowledging military-related deliverables and statements of intent, which followed memoranda of understanding that were announced at the November 2014 Asia-Pacific Economic Cooperation (APEC) summit in Beijing. He does not give these agreements much credit, offering a cynical interpretation: the majority of them and of proposals merely recommit China to doing what it was supposed to do already—adhere to existing international rules and answer the phone. None change the fundamental basis for Sino-American military tensions: Beijing is advancing its military and paramilitary posture in the Near Seas to uphold what it regards as inalienable sovereign rights. Washington remains determined to uphold international norms and prevent force, or the threat of force, from being used to resolve disputes. The impression is of trouble ahead. Robert Sutter closely examines another fundamental concern for China—relations with the United States. While Xi and Obama continue to meet and reach agreements in limited areas of mutual interest, a rising American debate over China policy is fed up by Xi’s repeated affronts and seemingly cavalier treatment of US concerns, Sutter observes. He brings things up to date by assessing the results of the September 2015 state visit of Xi to Washington, concluding that Americans increasingly distrust what they perceive as a double game of encouraging high-level bilateral discourse while undermining American interests in key regional, economic, and political areas. The frustration within and outside the US government grows in the face of Xi’s actions; there has been a toughening of behavior in some areas, warns Sutter. A significant debate has emerged inside and outside the government, he says, with those favoring a tougher policy toward China in the ascendance. This is the mood he conveys after Xi’s visit, complementing Andrew Erickson’s sober analysis of the military situation. Sutter reflects on what many in Washington are saying about how China policy must be handled. The overall situation provides a good foundation for effective actions carried out by a resolute US administration to deter Chinese expansionism by underlining to the Xi government the negative consequences if China continues assertive and disruptive actions in self-absorbed pursuit of the “China Dream.” To this, he adds that China’s actions show Xi to be duplicitous, playing a “double game” of promising good relations, while moving full speed ahead with policies that undermine America. As a future US government prepares to deal with Xi’s advances, it will likely view the Chinese leader as less trustworthy and predictable than earlier Chinese leaders. As for the regional environment, Sutter concludes that it is no coincidence that China’s influence in Japan, Taiwan, the South China Sea, Australia, and India has declined as the United States has enhanced ties with countries along China’s rim concerned with Xi’s assertiveness. An image of polarization emerges. From five perspectives, Xi Jinping looms as a transformative figure with contrasting results from those of Deng Xiaoping, reconstruction of China’s historical worldview challenges expectations after Mao’s thinking had been deposed, a contradictory approach to the rule of law undermines its essence, there is an unrestrained military build-up, and a contradictory approach to the United States is driving relations to a low point since the 1970s apart from short-term crises such as in 1989. Views in this set of articles are, of course, not universally shared, but they serve as a wake-up call for those who have remained optimistic about the promise of Xi’s leadership.